Wash hands. Wash all fresh, unpackaged produce under running water. Drain well. Mix together olive oil, lemon juice, do you Dijon mustard, salt, pepper, thyme and minced garlic in a bowl. Whisk until fully blended. Wash hands. Wash all fresh, unpackaged produce under running water. Drain well. Add all vegetables together in a bowl and toss with olive oil until properly coated. Grill vegetables to desired level of doneness. 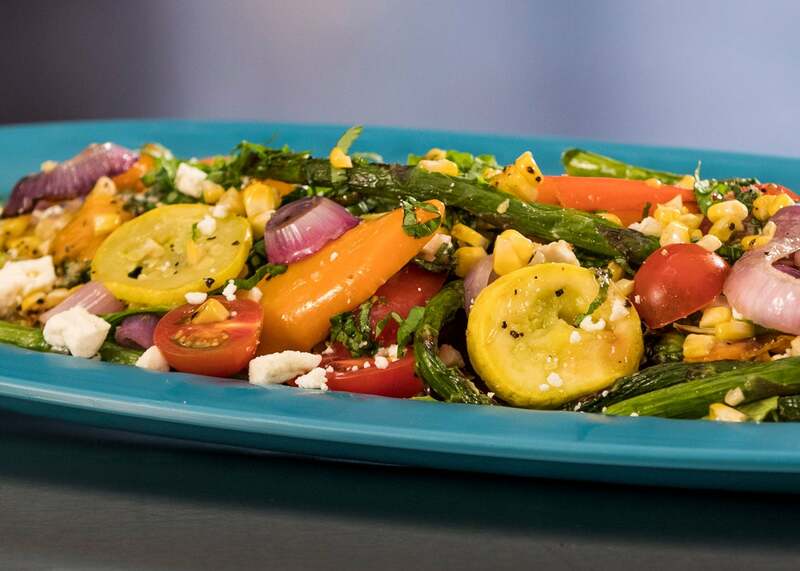 Chop romaine lettuce and make a bed on a plate cover lettuce with grilled vegetables, multicolor tomatoes, feta, and basil. Cover vegetable mixture with dressing and serve. CCP: Product must be cooled to a maximum internal temperature of 41°F or less, within 4 hours.